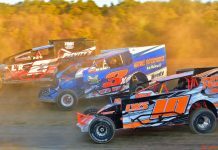 WOODHULL, NY – There may be a little snow on the ground, but Winter can’t stop Woodhull Raceway from kicking off their 2018 season schedule with this weekend’s Arnot Mall Car Show presented by Swarthout Recycling for the ninth consecutive season. Swarthout Recycling is a well-known supporter of local motorsports located in Beaver Dams, NY. They specialize in scrap metals including mixed steel, aluminum, copper, brass and cast iron. The recycling department accepts cardboard, newspaper, mixed office paper and junk mail, clear and green glass, tin and plastic. Swarthout is also a race fan’s go-to source for household and commercial refuse. Their large fleet of trucks and equipment has one of the area’s largest assortments of roll-off canisters in various sizes. They can also provide front-loading trash dumpsters in 2, 4, 6, and 8 cubic yard sizes for commercial refuse. The always-potent Woodhull racing community will line the halls of the Arnot Mall starting with move-in night on Friday March 16th. Drivers moving cars into the mall will participate in a brief driver’s meeting at 8:30PM, followed by moving race vehicles into the mall and a post-move-in gathering at Mooney’s to close out the night. 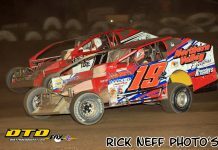 Nearly fifty race vehicles will fill each spot allowed by the mall facility to be used for the show, including racers across all of Woodhull’s weekly divisions. There will also be a 360 sprint car on hand representing the Patriot Sprint Tour with Kyle Drum’s No. 47. Thomas Video Productions will be on hand Saturday with copies of their popular Smash N Crash Volume No. 29, which was just released last weekend at Motorsports Expo. Mel will also have copies of the Short Track Super Series races from 2015, 2016 and 2017. Thomas Video will be the official videographer of Woodhull Raceway for the 2018 season, with longtime media talent Dan Bury behind the camera. 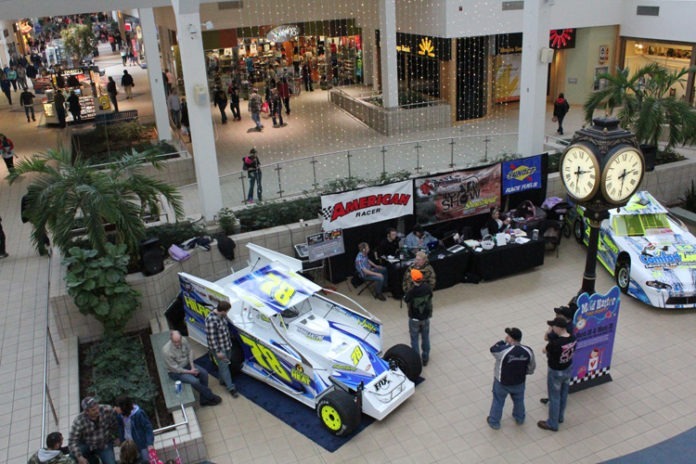 Opening Day of the 2018 mall show will also feature the Woodhull Raceway Pit Stop Challenge at 6:30PM in Center Court. This competition is open to the public and will feature teams of three changing a right rear tire. The fastest five teams in Round 1 will transfer to the Championship Round, with the top three teams receiving prizes. Turn 5 Media has stepped up to sponsor the Best Dressed Team Award as well. Day two of the car show will take place on Sunday March 18th from 11:00AM-6:00PM. Season passes and reserved seats will be available for purchase at the Woodhull Raceway booth in Center Court. Season passes for Adult Grandstands are $220, Seniors $140 and season pit passes carrying a $500 fee. Reserved seats are available for $25 per seat for the season.